Each is carefully textured down to the smallest details, like trim on shoes and gloves. Just as in the movie, this Elsa has her coronation outfit with and without gloves and her ice queen outfit. All 3 have 9 (nine) of their own special built in motions, as well as Gwynn's default motions - simply use the right click, perform feature to activate. 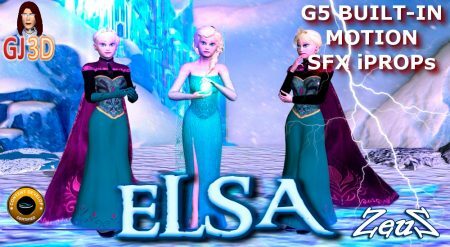 The pack also includes a wonderful winter SFX snow stage terrain with glowing animated snowflake and ice palace. Also included is a "conjuring snow" animated prop to use with the special included motion "ConjureSnow.iMotion". (Kindly take a moment to view the instructional video below to ensure successful use of these features). БОЛЬШОЕ СПАСИБО,ЗЕВС!!! --- ОЧЕНЬ КРАСИВО!!! --- ЗЕВС --- ВЫ ТАЛАНТИЩЕ!!! Thank you very much Zeus. Oh lord. I can now be so bad with this character and make her be the true evil being that she is. Thank yo so much Sir! Dreams of glory do come true.